Dana Johnson moved to Saugatuck over 30 years ago. He married Ginny, and is an avid tennis player. He’s our unsung hero because of all his work with the Senior Center. 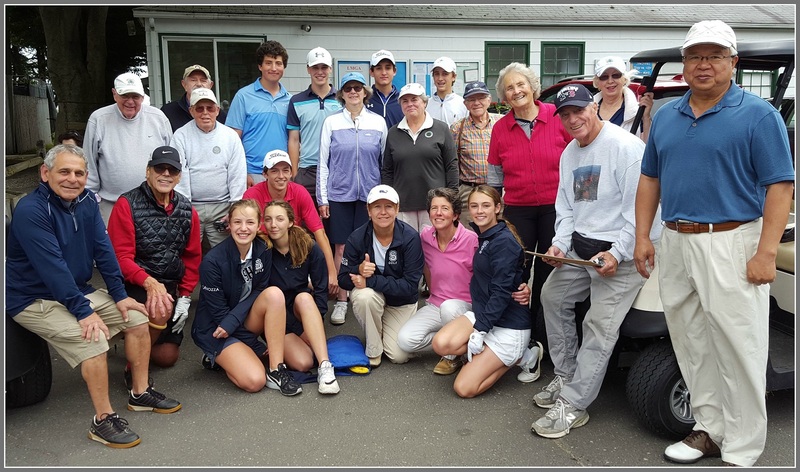 He serves meals, calls Bingo every Thursday to a devoted crowd, and organizes events like the Staples Senior Golf Tournament — an inter-generational event involving the high school boys and girls teams that benefits the center’s fitness program. Dana Johnson (2nd from right, with clipboard), at the Staples Senior Golf Tournament. Congratulations, Dana. Thanks for all you do, for so many! This entry was posted in Organizations, People, Unsung Heroes and tagged Dana Johnson, Sue Pfister, Westport Senior Center. Bookmark the permalink. Is without a doubt one of Westport’s greatest, and a Red Sox fan to boot!